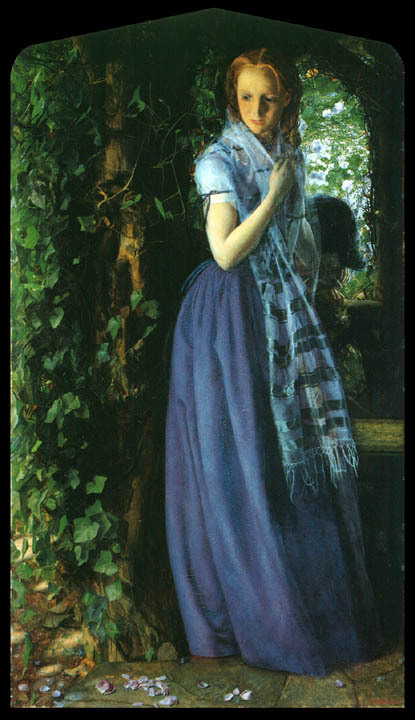 Deeply tucked away in the elusive corset of the Victorian social fabric, the art of the Pre-Raphaelite Brotherhood lay hidden and alluring. This “brotherhood” was a collection of seven artists, Dante Gabriel Rossetti, John Everett Millais, William Holman Hunt, James Collinson, F. G. Stephens, Thomas Woolner, and William Rossetti (Dante Gabriel Rossetti’s brother). By mid-Victorian times some of the artists of the Pre-Raphaelite Brotherhood, and several new artists associated with the movement, had become well known, albeit quite controversial. By late Victorian times a few of the Pre-Raphaelite artists had gone surprisingly “main-stream”, seemingly “sold-out” to the same commercial interests that shanghaied the Victorian Christmas into a commercial bonanza for the department stores of Fifth Avenue. And by the closing of Victorian times, as the trenches of World War I waited in the future for an unwary Europe, the artists of the Pre-Raphaelite Brotherhood and their works had quietly settled into the dust of obscurity. For the most part, critics from the modern art movement viewed the Pre-Raphaelites as trite Victorian baubles, best left in the closet and hardly worth a dusting more than once or twice a decade. To such critics the Pre-Raphaelites were disgustingly bourgeois. 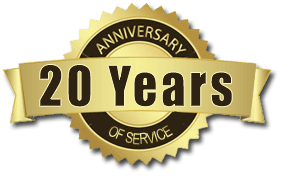 In contrast, with the advent of the 70’s the movement began to emerge from the closet and, today, it has once again become both “in vogue” and increasingly ubiquitous. Having been always associated with the forbidden mystique of decadence or “the Fleshly School” as some of their Victorian critics derisively called the Pre-Raphaelites, their quietly provocative images have climbed down the stairs from our grandparents’ attics to populate the side-walks of our cyberland rings – there being a remarkable number of websites devoted to Pre-Raphaelite works and their lives. Their subtly sensual art is a delightful respite for modern eyes grown weary from a rather constant bombardment of not so subtle images of sensuality. Although their more mundane works are indeed dated, their finest paintings are laced with a vivid palette and a haunting atmosphere. This, the first “Back Room” of TISA is a brief introduction to their fascinating lives and works. If you like what you see, we have attempted to provide both a listing of recommended readings and a set of links to some of the finest sites on the web devoted to their art, just waiting for your click. Enjoy. 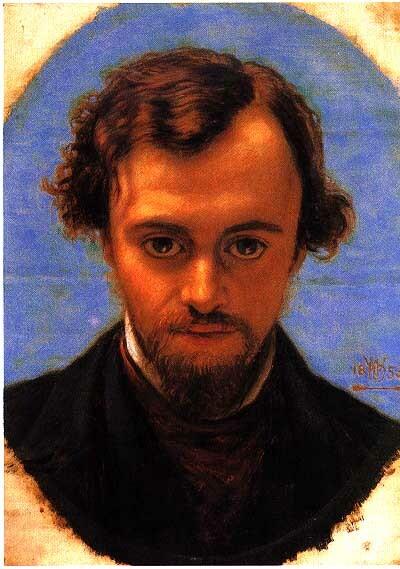 In 1848 three young men – Dante Gabriel Rossetti, John Everett Millais, and William Holman Hunt – while still grappling with the truculent hormones of their late adolescence, formed a secret club for artists. They chose the name the Pre-Raphaelite Brotherhood, because they felt that, as anyone with a sound mind could plainly see, art had gone downhill from the time of the Renaissance artist Raphael onwards. In their opinion, British art in particular had deteriorated into a collection of boring paintings, not so much based on the realism that they touted as their model, but on a false realism based on highly stereotypic rules as to what things should look like if painted well. To add insult to injury, from the Pre-Raphaelite perspective, British artists painted as if they had been legally bound by the Queen herself to paint solely with drab browns, olives, and ochres. 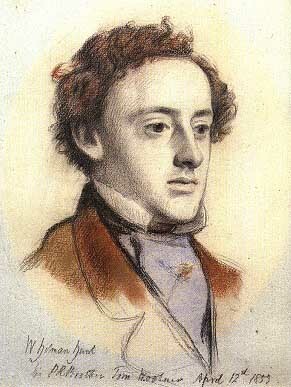 The boys had a particular disdain for the Royal Academy of Art, whose founder, Sir Joshua Reynolds, was unfairly nicknamed “Sir Sloshua” by Millais. It is with great irony that in later life Millais would accept the Presidency of this very same establishment, apparently no longer an icon of ridicule when seen with the eyes of a grey haired man. In the normal course of events these twenty year old youths,with their romantic notions of self-importance, should have become mere footnotes of adolescent grandiosity. But there was a catch. All three of them were brilliant. Rosetti had a knack for capturing the sensuality of women with a startling palette of velvety greens and languid reds that seemed to catch the fancy of all the underground circles of the London art world and of symbolist France. John Everett Millais would go on to become one of the most famous portrait artists in England, and as mentioned above, eventually assumed the presidency of the Royal Academy. 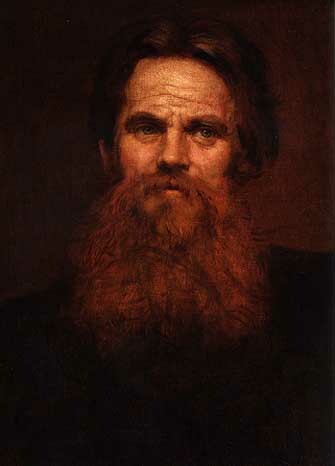 But in some respects it was the fame of William Holman Hunt though, that would prove to be the most astounding, for the reclusive Hunt would go on to paint one of the most famous pictures of all time. It was a picture of Christ called “The Light of the World”. In some respects Hunt’s painting has not passed the test of time well, but time has a tendency to be fickle. In its day, the painting drew massive crowds of people to London. Nor did its fame stop at the shores of merry olde England. It captivated the world. It has been estimated that, in Australia alone, four million people, or four fifths of the population, saw the painting two or three times. As the art historian Gay Daly pointed out, Hunt’s creation was the Star Wars of its time. Before the group disbanded they managed to publish a few editions of a rather radical journal The Germ, that would prove to be the rage of the artistic underground. More importantly they had created some true masterpieces of Western Art, some of which appear on this site. 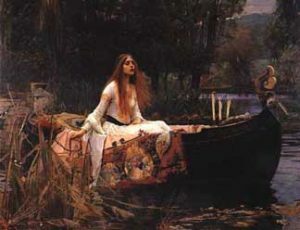 Although the list of players described above is exclusively male, the Pre-Raphaelite world was strongly influenced by women. At a more basic level the mistresses and models – known as “stunners” to the Pre-Raphaelite clique were important sources of visual imagery and even helped to define the Pre-Raphaelite sense of beauty. But equally powerful were the keen intelligences and artistic abilities of the talented women associated with the movement including one of the most revered of Victorian poets, Christina Rossetti, Dante Gabriel Rossetti’s sister. Other talented women included the artist and poet Elizabeth Siddal, who chose Rossetti to be her husband, and the gifted painters Kate Bunce, Evelyn De Morgan, Marie Spartali Stillman, and Eleanor Fortescue Brickdale. There is no question that the Pre-Raphaelite movement owes much to the staid world of the Royal Academy, for the Pre-Raphaelites were, in essence, a response to this world. Conservative academic painting defined the Pre-Raphaelite movement for the Pre-Raphaelites consciously designed a movement that rebelled against the establishment. More specifically, to counteract the artistic drabness of academic painting, the Pre-Raphaelites emphasized painting directly from nature, for nature was filled with surprise and serendipity, all of which the artist should capture in the minutest of details. In addition they began painting with a startling, for its time, array of luscious colors – wine reds, forest greens, and velvety blues. They also had a penchance for painting about powerful ideas and themes so they were drawn to literature, the Bible, and Medieval intrigues. Frequently they were quite literal about their symbolism. Less frequently, and arguably more powerfully, they were subtle in their approach to symbolism, merely whispering that “something” important had happened to the figure in the painting. More like an Eastern painting, what “that something” could have been was left to the imagination of the viewer. The cover painting for our Back Room, “Autumn Leaves” by John Everett Millais, demonstrates Pre-Raphaelite work at its best in my opinion. In this richly evocative painting we come upon four Autumn waifs lost in their work and their reveries. Are they sisters? Friends? No one knows. Are they enjoying themselves? Unhappy? No one knows. But we do sense that they are intensely involved in their own little worlds, whatever they may be. Something important is happening. In particular, the small girl in the forefront, holding the apple, seems lost in reverie. She is a fascinating example of the “detail work” of Pre-Raphaelites, a detailed emphasis on the outer world that sometimes points, paradoxically, towards the inner world. Note the bite out of her apple, and the fact that she has a slightly askew “wall-eye” that has wandered to the right. These touches of real humanness – simple appetite and birth damage – make her at once more real and curious. Most importantly she is not perfect, like a cute little girl should be, if painted by correct academic standards. One can almost hear a nonplussed Victorian critic thinking, “This is a wonderfully wrought painting, but my God, why did he choose to show her wall-eye? It could have been painted out so easily”. We also see here another aspect of the richness of “truth to nature” as shown by the virtuoso rendering of the leaves in the leaf pile. 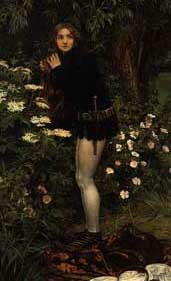 The technique of Millais would look almost more at home in a display of modern “hyperrealism” than on the walls of the Royal Academy. To boot, the colors have a deep and warm feeling, very atypical of the somber palette of much of academic art. 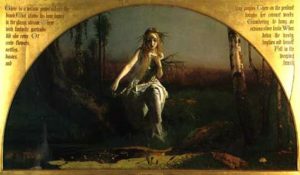 All of these touches would have made this painting potentially jarring to the Victorian eye, especially an academic one. We also see here an example of a whispered symbolism, as opposed to a potentially more hackneyed literal approach. The painting is, indeed, supposed to mean something. Millais stated as much. Apparently, for Millais, the intent was to provoke a quietly religious reference to the inevitability of death as symbolized by Autumn and the falling away of leaves to decay. Perhaps this feeling, almost of wonderment, is the focus of the little girl’s inward gaze as she pauses from munching on her apple. In any case the painting captures Autumn as well as any painting I’ve ever seen. Like a great painting can do, it adds something intangible, that a photograph could not do, for what it captures is not in the scene but in the head of the artist, where no camera lens may peek. 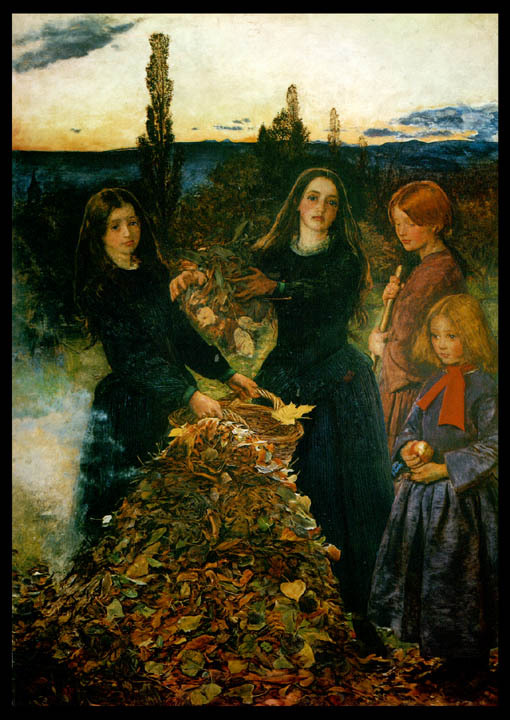 “Autumn Leaves” is Pre-Raphaelite work at its best. 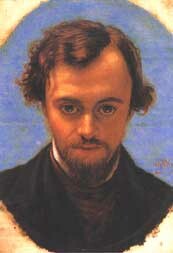 Interestingly, this painting by John Everett Millais was one of Dante Gabriel Rossetti’s most favorite paintings. Mixed. As one would expect, much of the criticism in the early years was hostile, sometimes vehemently so. More realistic renderings of human faces and bodies was bad enough with everyday people, but when the Pre-Raphaelites took this approach to religious figures like Mary and Christ as Millais did in his painting “Christ in the House of His Parents”, enough was enough. Charles Dickens nearly flipped out, denouncing this painting as truly, “commonplace and irrelevant”. In its day this comment would be like Steven Spielberg calling your movie a “pile of crap”. It did not bode well for the brotherhood, despite the fact that many critics had liked some of their work, especially the unmistakably gifted draftsmanship of the outlandishly precocious Millais. Indeed, the Pre-Raphaelites would probably have slipped into early oblivion, if it had not been for the intervention of the dogmatic, yet gifted, art critic and commentator on social values, John Ruskin. Ruskin was one of the absolute “top voices” of the Victorian Era, akin to a modern day Oprah, and he soon came to the rescue of our boys. Quite simply put – he thought they were great. Here were artists painting nature exactly as God had made it. There is no need to improve on that! Far from blaspheme, from the perspective of John Ruskin, each Pre-Raphaelite painting was an adoration of the ultimate Master. On a more personal note, Ruskin’s opinion of John Everett Millais dampened down just a tad after Ruskin’s wife had their marriage annulled – apparently Ruskin had not consummated the marriage – so that she could marry Millais, with whom she proceeded to have six children. Her new Pre-Raphaelite husband apparently had no problem consummating marriages. 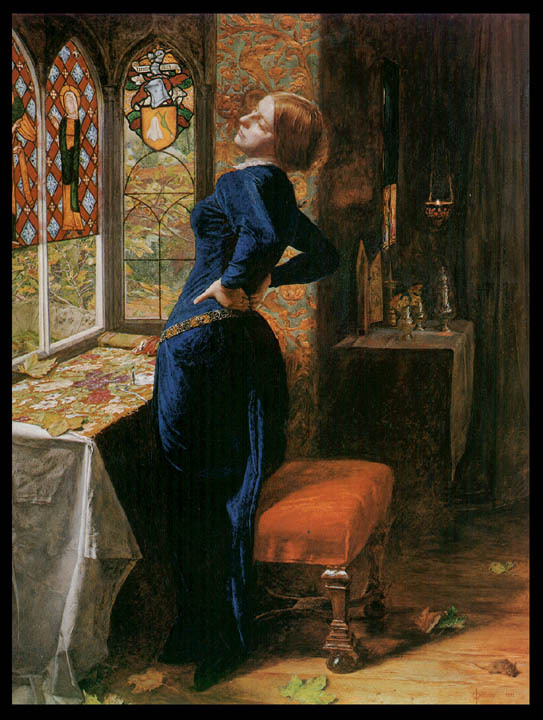 Nevertheless Ruskin would prove to be right with regard to the enduring influence of the Pre-Raphaelites, although their true place of importance has been long in receiving its rightful recognition. Even to the modern eye, as hopefully this site shows, some of these paintings are simply gorgeous. Moreover, the influence of the Brotherhood would prove to be much more enduring than one would suspect from the brief existence of the original brotherhood from 1848-1853. Indeed some critics loosely view the movement as lasting until as late as 1910. There is no doubt that a second generation of Pre-Raphaelite artists, who had a powerful influence on the future of Western painting, did grow out of the Brotherhood itself. 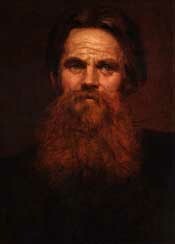 All of the following artists could be viewed as part of the “new” Pre-Raphaelite clan including: Burne-Jones, John William Waterhouse, Algernon Swinburne, Spencer Stanhope, Marie Spartali Stillman, Arthur Hughes, Evelyn De Morgan, Sidney Harold Meteyard, and, to a lesser extent, William Morris, some of whom had the privilege of personally knowing the original three founders of the movement. The influence of the Pre-Raphaelite Brotherhood is surprisingly profound, for the second wave, especially Edward Burne Jones (who greatly impacted on Audrey Beardsley) and William Morris (who essentially created the Arts and Crafts movement), became extremely influential. Both Morris and Burne Jones loved the wonderful curving lines of Rossetti and the symbolist feel of the early Pre-Raphaelites. Coupled with an appreciation of the visual power and decorative power of the early Pre-Raphaelites, these sensuous lines were ultimately transferred into the Arts and Crafts Movement, Art Nouveau, and eventually Art Deco. An equally powerful line of influence was the popularity of Rossetti and Burne Jones with European Symbolists, especially in France. In part, these Symbolists, in their own right, would influence the early phases of the abstract art movement in its search for spiritual meaning in abstract form. 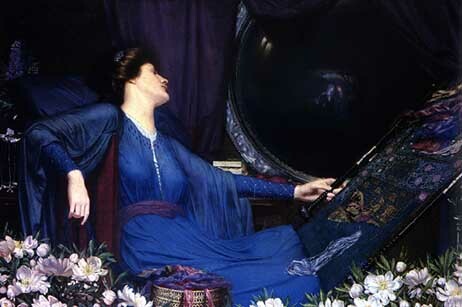 Thus it can be seen that the Pre-Raphaelites were one of the first of the 19 century artists to emphasize the importance of art as true decorative space. Ironically, despite their emphasis on truth to nature, they helped set the foreground for modern art. In the wake of the Pre-Raphaelite mystique, painters felt they could more openly break the limiting rules of the Royal Academy. Artists began to experiment more daringly with curving lines and luscious colors – aspects still of prime importance in contemporary art from the dustjackets on our books to the images on our websites. Please let us know what you thought of our first Back Room at TISA via Email. Thanks for joining us.